You see, one day Mark went out to check his rabbit snares. He was really hoping to find a rabbit that I could cook up for supper that night. When he got to one of his snares, he was surprised at what he found. "Golly day, a hawk," he declared. That’s right, my son had caught himself a hawk. "Now how did a smart bird like you get caught in my rabbit snare?" Well, being the adventures, curious type, he wanted to put it in his burlap sack and bring it home for me to see. He knew I’d be amazed at just what he could catch in that snare of his. He took the burlap sack and threw it over the hawk. Then, carefully, he grabbed the hawk by it’s feet. Naturally, the hawk started flapping around. He didn’t want to be stuffed into an old bag! Mark told the poor bird to hold still. "I ain't gonna hurt you." He put the hawk in the bag and tied him fast to his saddle. “Now, you be quiet. As soon as I finish checking the rest of my snares, I’ll take you home and show you to my pa,” Mark told the bird. One of the snares he went to was broken, and he could tell something had gotten caught but got away. "Doggone, whatever it was got away," he declared. Looking up, he saw a campfire. He started to go closer and check it out. Everything was quiet as he stood and looked at the campfire. But suddenly somewhere from behind him, he heard the very serious voice of a man. "Don't move, boy!" Mark’s head flipped around. He was quite started by the voice. All of a sudden, a big man with a big stick came out from behind a tree. Naturally my boy was scared to death! "I said don't move!" Mark wasn’t sure what was going on. Before he had time to figure it out, the man rushed toward him with the raised stick. Mark was afraid the man was about to beat him with it and bent over to get out of the way. But the man pushed him out of the way and rushed passed him and began beating a rattlesnake with the branch. The snake had been just about to strike Mark. The man apologized to Mark for scaring him. But Mark was still in shock. Suddenly, he felt like he was going to be sick, so he quickly hurried away. Mark was grateful, to say the least. “I reckon on how you saved my life,” he said to the man as he stirred something over a camp fire. “I’m pleased, mister…” Mark realized he didn’t even know the man’s name. Walt didn’t feel like he did anything special though. He’d only done the natural thing. “Makes us even,” he stated. Mark was confused. 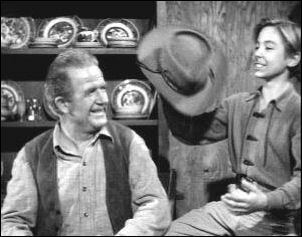 Walt told him he had taken a rabbit from his snare. My boy always did have a big heart for others. Today was no different. “Say, if you want, you can come along with me while I check the rest of my snares. Maybe we’ll find a rabbit. I told my pa that if I did that…well that we’d have rabbit stew tonight. Even if we don’t, my pa’s got a side of beef hanging. You’re welcome to share it with us.” Walt was more than happy to agree. But he brought the dead snake with him. He wanted to put it in the burlap sack, but Mark informed him he had a live hawk in there. “I’ve never knew anyone keeping a live hawk before!” Walt stated. So that’s how Walt and the hawk came to live with us for a spell. I was quite surprised with my son. He had gone to find a rabbit and came back with no rabbit, but a lot of unexpected things! I agreed to stake that hawk for him. Before l etting the hawk out of the bag, I made sure Mark really wanted to keep this hawk. Walt looked sadly at the staked hawk. “He don’t like that. No sir, not one bit!” he stated. I wouldn’t like it either. “How come your staking him then? A bird like that oughta be free!” Walt stated. I had to leave it up to my son. He had to learn these things for himself. But I did give Mark another chance to think about what he was doing. Mark thought about it. In fact, at one point I thought he was going to make the right choice. But he decided in the end that he wanted to keep him…for a while anyway. It was getting time for supper. We started talking about food, and I couldn’t help but to tease Mark a bit. “Well, all we have is beef steak and potatoes. I sure had my heart set on rabbit stew,” I gave my son a mock frown. “I’ll get a rabbit tomorrow. You’ll see!” Mark promised. “Well, you know, you didn’t do so bad today considering. You know, out of seven rabbit snares, he came back with you, a live hawk and a dead snake!” I told Walt as I laughed..
“Oh pa,” Mark said. I told Mark to go get washed up. He didn’t want repaid. “A place like here needs a lot of fixing. Mending fences and cattle branding, what not. Supposing you let me stay on here for say um…a week or so. I could earn whatever you plan to give me,” Walt asked. That sounded fair to me. I politely mentioned that he had never told me where he came from or where he was going. “I reckon I don’t really know. I’ve been to a lot of places and I have a lot of places to go to. Some would call that being a saddle bum, I guess. But not me. I call it being a free man. I thought that as long as he was happy, that’s all that mattered. One day Mark and I were getting ready to go into town. 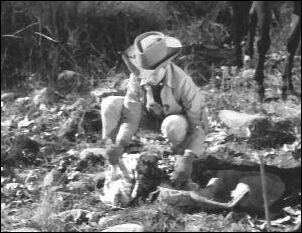 Walt was busy working on the rattlesnake skin, but he wouldn’t tell Mark what he was planning on doing with it. As we rode into town, Micah was outside with a man named Ely Flack. 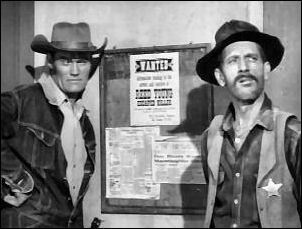 They were hanging up a wanted poster. Micah introduced me to Ely, but he didn’t need to. I knew who he was. Just the man’s being here made my blood boil. I wanted to talk to Ely, but not with my boy present, so I sent him to take care of the team. The last time I heard of him was when he brought in the Kelly brothers back in Oklahoma. Two of them were dead and the other one was near out of his mind. He was beaten up really bad. They weren't even wearing guns. "My job is to bring in escaped convicts, McCain. Ain't none of your business how I do it. Besides I got everyone I went after, one way or another," Flack stated. I wasn’t happy with him being here. I smelled trouble. “I’m surprised you even let him come around here, Micah!” I stated. Flack tried to convince us that he would uphold the law. I wasn’t buying it though. He was sure the man he was looking for was around here. Flack said he had trailed this guy for a hundred miles. Then three days ago he just up and disappeared. He thought he was hiding out or someone was hiding him. “But I’ll find him. And when I do…” Flack’s voice trailed off. I knew what he’d do. “You gonna kill him, Flack? Like all the others?” I frowned at him. I hadn’t been happy since the moment I read that wanted poster. What I was thinking was hard for me to believe. Micah could tell I was more upset then just about Flack and he asked me if something was bothering me. “Yeah,” I answered solemnly. “According to that description, the man Flack’s looking for has been at my ranch for the last three days!” Micah was surprised to say the least! “I’m not sure, Micah. I’m just hoping,” I stated. Micah finally gave in, and I knew it was because of our close friendship. “But if you’re not back by tomorrow sundown, I’m coming out there! And I hope it’s not to pick up the pieces,” Micah declared. I started to leave. But Micah stopped me. He had to know something. "Lucas, why do you want to do it this way?" "He saved Mark's life," I replied. He nodded at me. Knowing how I felt about my boy, I think he understood then. I told Mark I felt the same way as he did. I didn’t want to believe this. I really liked Walt! “But we can’t take any chances. You know that,” I stated firmly. Mark did know that. His life was too precious to me, and it was my job to protect him. “I want you to act natural. Don’t let on that either of us suspects anything.” I wanted to wait until Mark was safely out of the room before I broke the news – just in case. “What are you gonna say to him, Pa? What are you gonna do?” Mark wanted to know. Ever since Walt brought that snake back to the ranch with him, Mark had been curious about what he was doing with the snake skin. Well, he found out that night. Walt had made a band for his hat. Mark was so thrilled! Walt asked if Mark liked it, like he really needed to ask! Mark was so excited that he was practically bursting! “Do I like it? Golly!” Mark said as he twirled his hat around. He showed it to me as if I didn’t know what was going on. “That’s fine, son. Real fine,” I stated. I had been cleaning my rifle. “Hey! That’s what Walt was doing with that rattlesnake skin all along! Just teasing me! Trying to make me wonder.” Walt laughed and put Mark’s hat on his head. “Boy, wait until the kids at school see this! Wahoo!” Mark yelled. I told Mark to thank Walt and get to bed. Mark thanked him. “I’m glad you like it,” Walt stated. “I do! I really do!” Mark assured him. Then Mark came to hug me and say goodnight to me. I told him goodnight. Then the reality of what was about to happen as soon as he went into that room hit him. He was suddenly not smiling anymore. He looked at me, then at Walt. “Thanks again, Walt,” he stated. I could tell what he was thinking, but there wasn’t anything I could do to help him. I gently told him to go on to bed. With my eyes, I tried to promise him everything would be okay, but I myself didn’t know how the next moments would go. “I never knew a boy yet what didn’t like surprises!” Walt commented happily. “A friend of mine?” Walt asked. He still didn’t know what this was all about. I put my rifle up then. I knew I wouldn’t be needing it. “Maybe not. But you’re in trouble, Walt. You broke jail. I knew how he felt. But I also knew he wasn’t really free. I told him he could never be free, not as long as he was running. “You’re not free, Walt. Everywhere you go, every corner you turn, you’ll be expecting somebody.” Just talking about it made me look out my own window. Flack made me nervous. I was worried for Walt. Walt was afraid of Flack. I assured him that Micah was a very good friend of mine and he would make sure he stayed safe. Micah could help him get his case reviewed. But Walt knew Flack. He knew the type of man he was and that he didn’t have a chance with him. 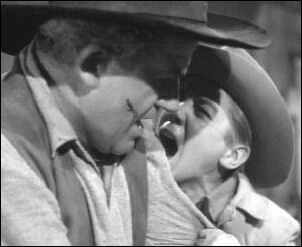 If he rode into town to turn himself in, Flack would catch him and kill him. “You tell that Marshall to come out here and get me!” He didn’t want to go anywhere near Flack. I asked him if he’d stay here while I rode in to get Flack. He promised me he would. “Good. Now that we’ve got that settled, I guess we better turn in.” I stated. Walt was quite shocked. He couldn’t believe that after what he told me, I would let him sleep in my barn. I suppose I was different from a lot of other men. But I trusted this man and I believed his story. “You and that boy of yours…” Walt stated. I smiled and said goodnight. Then I went to bed. We were fixing to leave for town the next morning. Mark told Walt that he was thinking about letting the hawk go. I think he was thinking about the injustice that had happened to his friend and realized he had been tying something down that should have been allowed to stay free. I had just finished saddling our horses and brought them out. Mark had to say goodbye to his friend. I wished I could make this easier for him, but he had to learn that this was reality. Mark asked Walt if he’d come back and visit. I guess Mark had as much confidence in him as I had. Walt said he’d come back if it was all right with me. It was more than all right with me. I considered him a friend. We rode into town and stopped at the Marshall’s office. Mark pulled his horse up along beside me and sat there, watching me go into the Marshall’s office. I wasn’t sure if he wanted to stay and listen to our conversation or dawdle to stay away from school as long as possible. Either way, I quickly turned and gave him the look. “What are you waiting for?” I asked. “Nothing,” Mark answered, knowing he better get moving at that moment. I had to laugh. That boy! Mark’s silence told him all he needed to know. Flack dropped Mark’s hat and took off for my house. Mark picked his hat up then raced for the ranch, taking the short cut. Mark raced as fast as he could. Flack was outside when Mark got there. "Walt, Walt, Walt, it’s Flack! Flack's coming!" Mark yelled. Walt rushed inside and got the rifle from above the fireplace. "It's Flack, he's coming up the main road, I took the cut off," hollered Mark. "Your Pa double crossed me, now I've got to face Flack all by myself," said Walt. "It wasn't Pa, it was me, the hat, the snakeskin!" The old rifle above the fireplace didn't work. The only other gun we had other then my rifle was at the blacksmith's getting fixed. Suddenly, they heard Flack outside. “Where are you, killer?” he was hollering. Walt knew time was up. He felt desperate…hopeless. But his first task was to protect my boy. He grabbed Mark by the arm and pushed him into the room. But before he could get the door closed, Flack busted inside with his gun drawn. Suddenly, everything was quiet. Walt was facing the gun and the one man he was terrified of. "Well now ain't this nice. Well killer, looks like I got to teach you a lesson. I don't like nobody go bustin' out of my jail. You did, so I guess I got to teach you a lesson," Flack sneered. Walt begged Flack. He begged. But Flack suddenly punched Walt across the face with his gun. Then suddenly, my boy was there fighting him off. Flack made a big mistake! He pushed Mark. This made Walt very angry and he charged at Flack. They fought, throwing things at each other. Mark stayed out of the way. He was scared. Suddenly, Walt punched Flack over and over. He pinned him in my chair and put his hands around Flack’s neck. Now Flack was begging. "You killed your last man Flack, you got no right being alive!" Walt declared. He punched him again and again. Walt was choking him. "That's enough Walt, your killing him," hollered Mark. "Let him go Walt, let him go, please stop!" There was desperation in Mark’s eyes. His voice was loud as he yelled these words. Just then Micah and I rode up and heard the Mark’s yelling. We immediately headed for the house. Mark grabbed a hold of Walt and hollered again "Walt please, you told me you could never kill anyone. You told me you couldn't." Mark Hollered louder. He got right in Walt’s face. He was screaming as loud as he could. He was becoming more desperate, fearing Walt would indeed kill this man. "Listen to me, listen to me, let him go!" Mark screamed. Mark’s screaming finally got Walt back into his right senses. Walt let go and Flack sunk to the floor. By then we were in the house. Micah checked Flack. He was in bad shape. I didn’t understand what was happening here. I thought Mark was on his way to school. Why was he here? My eyes held so many questions. Mark knew only one answer was needed at the moment though. In his calm voice, he stated, "It was self defense Pa, he was going to kill Walt." "Looks like he finally got what he deserved," Micah simply stated. Walt was suddenly more grateful of my boy. "I guess I would have killed him if it wouldn't have been for Mark.” I couldn’t help being proud of my boy. I wasn’t sure what brought him back at the moment, but I was certainly glad he had been there! “I'm ready to go back with you now Marshal," said Walt. I knew he would be okay. Mark did decide to let the hawk go. He had met a man who’s freedom had been taken from him in order to save the skin of another. Mark’s heart ached for the injustice that had been dealt to Walt. He had finally realized just how much things should be allowed to stay free. He told me to let him go. Mark and I stood there and watched the hawk soar in the sky. The hawk was finally free. Happy. Mark would be happier knowing he had made the right decision. "You know Pa, Walt was right all along. That bird never did nothing to get chained up for. Think Micah will be able to help Walt, maybe get him off?" I knew he had a million thoughts and questions going through his head. I put an arm around my son and smiled at him. I didn’t know all the answers, but I could assure him of one thing, “I’d say his chances are as good as that hawk’s when you brought him home.” By him, Mark knew I wasn’t just referring to the hawk. Mark’s good deeds had paid off, and if Walt was able to get free, Mark can rest assured that he played a big part in that! piddlin' stuff.....Patrick McVey appeared in two episodes ― The Hawk as Walt Hake/Reed Young, the man who was wanted by Flack ― The Quiet Fear as Jake Striker, the father of a deaf daughter. John Anderson appeared in eleven episodes ― Shotgun Man as John Beaumont, he was the man that wanted revenge on Lucas for sending him to jail ― Shivaree as Chet Packard, he was the one who Derek shot in the leg ― The Hawk as Ely Flack, he was the man who was looking for Walt Hake/Reed Young ― The Journey Back as Will Temple, he was the man who had the scare on his face ― Day of the Hunter as Cass Callicott, the famous frontiersman, trapper, scout, buffalo hunter, one of the old original mountain men ― Mail Order Groom as Jess Profit, he was who slapped Isabel across the face ― The Retired Gun as Owny, he was the one who threw the coin on the ground ― Face of Yesterday as Hank Clay, the mean step-father ― Incident at Line Shack Six as Gangling, he was the one who killed Charley Breen ― The Patsy as Sully Hobbs ― Old Man Running aka The Wanted Man as Samuel Gibbs, Mark's Grandpa, Lucas' father-in-law. 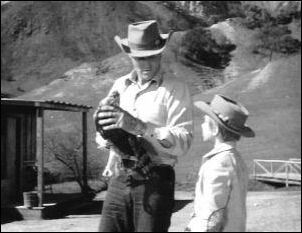 We saw him so much on The Rifleman that you would have thought of him as part of the family. Come to think of it, he was part of the family. Do you remember which episode that was? 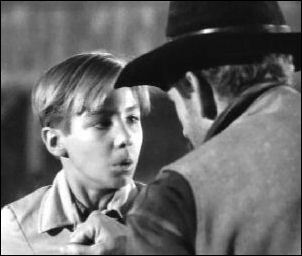 Fred Aldrich appeared in The Rifleman several times. Eight Hours to Die as a spectator at the hanging - A Matter of Faith as a cowboy in the crowd - The Challenge as a Barfly - The Hawk as a townsmen and The Wrong Man as one of the townsmen at the carnival. Whitey Hughes was a well known and respected stuntman, he appeared in twenty-seven episodes of The Rifleman and still counting. Whitey had over a 50-year career as a stuntman and stunt coordinator, he has been praised as one of the top stuntman in Hollywood. Whitey was the best of the best!